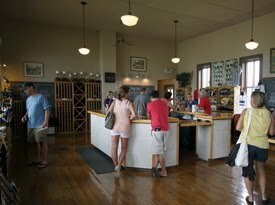 As I traveled Leelanau County, and the west side of Grand Traverse Bay, many of the winemakers and tasting room folks I chatted with insisted I had to go out on the Old Mission Peninsula which divides the Bay and features some outstanding wineries. 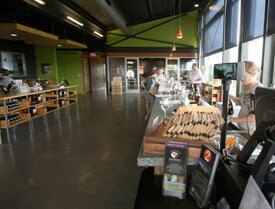 So after a business commitment Thursday morning, I headed to Peninsula Cellars. The peninsula has very little if any commercial development beyond the wineries and a few cherry and apricot stands dotting Highway 37. The peninsula is only three miles wide at its widest with a few stretches where you can see the Bay on each side. It’s really a beautiful area. Again, I’ll be using most of the material from this week’s trip for a story on Palate Press about Michigan wine, a column or two and plenty leftovers for Grape Sense. They have a dry and semi-dry Riesling for $14.99 each. I also liked their very dry Pinot Blanc ($17.99). 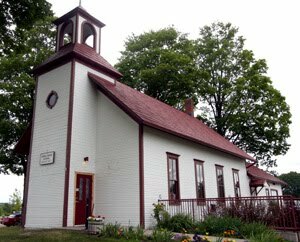 One of the most unique things about Peninsula Cellars is the tasting room’s location in an old one-room school house (See top right). They are smart enough to have kept the interior historically accurate (at left) and to have a little fun with the setting. I had debated driving all the way out to the end of the peninsula to visit the newest winery, 2 Lads – but I’m sure glad that I did. The first thing noticed is the incredible view of the eastern bay from the tasting room on a hilltop. The second thing is the ultra modern, urban looking winery. It’s all tied together by a very clever marketing person who has labeling which rivals anything you’ll see any where in the wine industry. I tasted a beautiful Riesling, a nice Cabernet Franc, and the best Rose’ of my trip. They make their Rose’ from Cabernet Franc. I’ve written before I’ve had Rose from a whole host of different grapes but never this one. This Rose’ rivaled, if not surpassed, many I’ve enjoyed from France and Spain made from Grenache. It just sounds yucky, Cab Franc Rose, but it was a wonderfully smooth and fruity wine with a hint of acidity. Notes are in the car, but I believe I paid about $18 for a bottle. These two serious winemakers are going to be heard from in coming years. They only produced 4,000 cases this year with 2009 being a tough year weather-wise for grape production in Northern Michigan. It’s just their second vintage on the shelves. But they’ve clearly made a huge investment and they’re making some great wine. Take a look at this short video to get an idea of what I’ve described above. 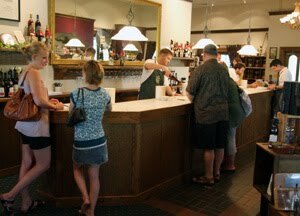 Today’s final stop was one of Michigan’s big wine operations – Chateau Grand Traverse. They are up around the 100,000 case mark and clearly one of the industry leaders in Michigan. The wine list is extensive and interesting. I tasted good Riesling and an interesting dry Pinot Grigio. But there was another standout wine and fun moment for me. First, they grow Gamay – the Beaujolais grape. You can’t call it Gamay in this country so they call it Gamay Noir. They have a regular bottle ($12) and a reserve ($19). I liked the reserve a lot. It was not as earthy as the French versions but very nicely made wine with true Gamay flavor with good acidity and tannins on the finish. The second moment was a 23-year-old college student, I wish I’d asked his name, who had remarkable wine knowledge. He was rattling off residual sugar in various wines, other facts and details. He is taking the tests this year to become an accredited sommelier. 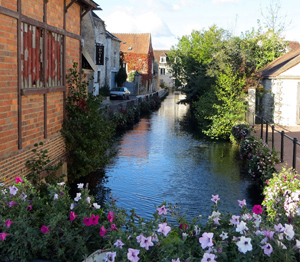 When tasting the Gamay Reserve this dark-headed fellow noted it was more like a Beaujolais Grand Cru – when I asked specifically which one he thought it most reflected he smirked and said he didn’t know, but correctly added there are 10. Friday is my last day on the road. I am going to make a stop or two in southwestern Michigan where the whole trip began then head home. I’m sure my dog misses me! Postscript: Nothing to do with wine, but coming back through Traverse Bay I had lunch and apple pie at the original Grand Traverse Pie Company. Those readers in the Midwest, at least, will understand!